An 18-year-old Long Island high school student inspired by Osama bin Laden tried to travel to Yemen and join al-Qaida operatives in waging “violent jihad,” federal authorities said Wednesday. Justin Kaliebe, of Babylon, pleaded guilty to providing material support to terrorists in a secret hearing on Feb. 8. During his appearance in federal court in Central Islip Wednesday, Kaliebe's attorney asked that his client receive a medical and psychological review at the Butner Federal Prison Hospital in North Carolina. Investigators said Kaliebe approached an undercover officer about joining a terror group and admitted he followed teachings of terrorist Yemeni cleric Anwar al-Awlaki and Sheik Omar Abdel-Rahman — the blind sheik tied to the 1993 World Trade Center bombing. In secret recordings, Kaliebe claimed he wanted to travel to Yemen to fight the “Yemeni army” and to kill “those who are fighting against the Sharia of Allah … whether it’s the U.S. drones or their puppets,” prosecutors said. 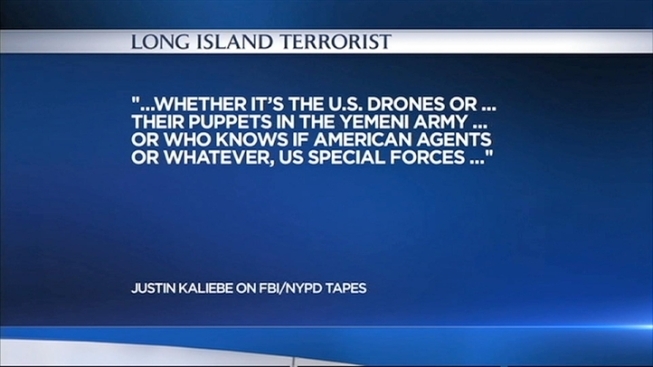 The NYPD said Kaliebe told an undercover officer that he planned to buy a plane ticket for Oman with the goal of traveling to Yemen and sent an email pledging his loyalty to al-Qaida saying the only way he will leave the terrorist mission is through martyrdom. On Jan. 21 he was arrested at Kennedy Airport trying to fly to Yemen. Kaliebe was a student at Babylon High School at the time. “The NYPD is concerned about the continuing interest of some young Americans in violent jihad and their identification with terrorist organizations," NYPD Commissioner Ray Kelly said in a statement. "That is why the NYPD Intelligence Division continues to track individuals allegedly evincing support for terrorism." Officials said the investigation is ongoing but it appears Kaliebe in some ways became self-radicalized by watching terrorist preachings online. “He set the wheels in motion – convinced of his well-thought-out plan – but didn’t get very far,” said FBI New York Director George Venizelos. Terror cases such as this are often sealed if investigators try to get the defendant to cooperate. Once that cooperation has ended, the case is made public. Kaliebe faces up to 30 years in prison at sentencing, scheduled for Sept. 27. He remains behind bars.